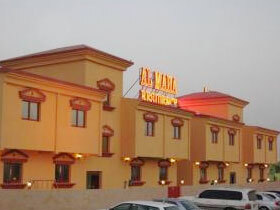 Al Maha Residence Ras Al Khaimah UAE - Ras Al Khaimah Discount Hotels, Resorts & Apartments!! Al Maha Residence Ras Al Khaimah - Ras Al Khaimah Hotels, Resorts & Aparments United Arab Emirates with Special Discounted on Published Rates!! Whether you are a traveler for Business or Leisure, Al Maha Residence would like to extend to you a warm welcome to Ras Al Khaimah and invites you to experience this beautiful city while enjoying all the comforts at 'your home away from home'. Al Maha provides our guests with 36 fully furnished and decorated studio apartments. Each consists of a master bed room, a well-set kitchen and the bath. Hotel Al Maha honors you by dealing on the provision of full comfort and distinguished service to our guests.